Nick grew up in Adams, WI, and traveled down to Clarke University (Dubuque, IA) to receive degrees in Finance and Accounting. 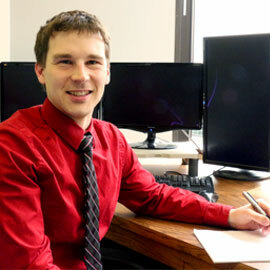 After college, he moved to Northern Wisconsin where he worked for a small accounting firm. While there, he was heavily involved in working with non-profit entities, preparing tax returns, audits and often times volunteering. Nick has been with Hansen House Company since November 2017. If you are ever searching for Nick in his spare time, you are bound to find him outdoors. Biking, fishing, hunting and cross-country skiing are a few of his favorite outdoor activities.